Poets in western Massachusetts contributed to the book "Compass Roads." Clockwise from top left, Forrest Proper, Marian Kent, editor Jane Yolen, and Diana Gordon. "Memory in furrows and harvests in fields" in Hatfield, Massachusetts. Forrest Proper reads from the anthology "Compass Roads" at an elbow of the Connecticut River in Hatfield, Massachusetts. Forrest Proper at an elbow of the Connecticut River. Marian Kent at a gas station on Armory Street in Springfield, Massachusetts, reading her poem. The Sunoco on Armory Street in Springfield, Massachusetts, inspired the poem "Eating Crow." Marian Kent's poem, "Eating Crow," in the book "Compass Roads." Marian Kent reads her poem in Springfield, Massachusetts. 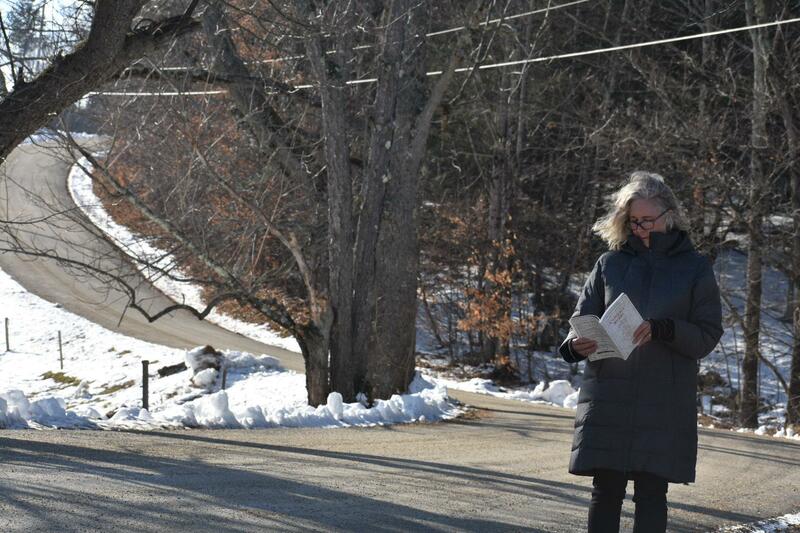 Diana Gordon reads her poem in Hawley, Massachusetts. Diana Gordon on the side of the narrow, twisted road where she set her poem "On West Hill Road" in Hawley, Massachusetts. Jane Yolen sits at her kitchen table with the book of poetry she edited, called "Compass Roads." "It's beautiful here in the fall," poet and bookseller Forrest Proper said, "when you get the whole vista of the fall leaves — and the Connecticut River with the leaves. It should inspire more poetry. More people should stand out here on a 12-degree day in December, and be inspired to write poems!" Proper did write one. His poem, "The Fields of Hatfield," is among more than 100 previously-unpublished poems in a small, recently released book, "Compass Roads." It was edited by the prolific author and editor Jane Yolen. 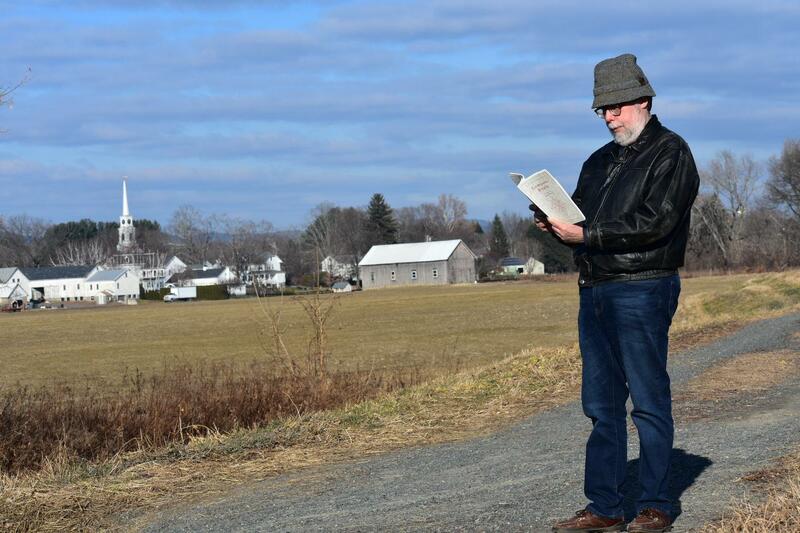 Poet Forrest Proper reads from the anthology "Compass Roads" at an elbow of the Connecticut River in Hatfield, Massachusetts. "I see it as a kind of compass that you could have with you when you travel around the valley," Yolen said. "I'd go, 'Oh, wait a minute, there's a poem about this,' and stop and read that poem aloud when you're at the place." Though all of the poems are about the Pioneer Valley, they take many forms. There are rhymed poems, non-rhymed poems, poems about people and about place. "Some of them are going to be very surprising to people," Yolen said. One of the book's surprising poems is "Eating Crow," written by poet Marian Kent. The setting? A gas station in the city of Springfield, Massachusetts. Her poem is just 11 lines long. Kent said she wrote "Eating Crow" after the 2016 election. As part of her work commute, she would pass by Springfield's Armory Street. "In the fall, there is actually an amazing display of bird life flying overhead," she said. "It's not happening right now, but after work there would be just a huge number — hundreds of these crows flying back and forth across the street." their timelessness., these little dinosaurs that survive. Gordon said "On West Hill Road" was inspired by the geography and history of Hawley, Massachusetts. "It’s way high, and it’s very twisty and windy," she said. "And I was passing farm houses, and was thinking what it was like to build this road and be up here." Gordon said her poems are often more imaginative than the one selected for the anthology. But while her poem is about what she thought the road was like centuries ago, she said the turkeys she included were very real. Diana Gordon stands on the side of the narrow, twisted road where she set her poem "On West Hill Road" in Hawley, Massachusetts. Gordon imagines readers might use "Compass Roads" in a very different way than how Jane Yolen described. "You probably put it in your bathroom, and you pick it up every now and again, when you need to," Gordon said. "Compass Roads" is a book of poems about our region that you can read… anywhere.